An American small sedan with Italian roots, the 2015 Dodge Dart has features and style as cosmopolitan as its roots. Offering three engines and five different models, the Dodge Dart goes head-to-head not just with domestic rivals like the Chevy Cruze and Ford Focus, but with segment leaders like the Honda Civic, Mazda3 and Toyota Corolla. My car is very gas efficient. As a college student who commutes to school everyday, having a reliable car is necessary. The commute to school is about a total of 50 miles every day. My car is very gas efficient and filling up my gas tank is inexpensive. I only fill up about once a week so the costs on gas are not bad. I bought the car as a used car. It used to be a rental car before I bought. Even though it already had a considerable amount of miles for how old the car was when I bought it, I still experienced no problems with it at all. My car is very comfortable and spacy. I have taken several road trips with it and it made the trip feel more comfortable. I have only experienced one problem with my car, that being my car battery dying. I replaced the battery and the car worked like it was brand new. One of the more important features for me is the effectiveness of the ac unit in the car. Living in the south can get very hot in the summer. When I get in the car and turn the ac on, it cools down immediately considering how hot the car is when I get in it. In the future, I would consider buying a newer model if I am ever looking to buy a new car. In my opinion, it is a great bang for your buck car. Good power, good fuel economy, a nice interior, and great tech for a relatively cheap price. Also, they don't make them anymore. It is a 2015 Dodge Dart, finished in a dark gray metallic color. I really like the way the exterior and interior look, the car's handling is great, and it even sounds nice for a 4 cylinder off of a cold startup. The interior is reasonably roomy, and the seats are relatively comfortable. Fuel economy is good, but I wish it were better for a 4 cylinder. I love the tech features in it, but I wish the map updates were free and that it had Apple CarPlay. The thing I dislike most about my car is the transmission- first, I wish it were a manual (personal preference), but the transmission just seems to struggle all the time. It's tough to get up and go at passing speeds, and it stays in gears for too long sometimes, this robbing me of fuel economy. Overall, I like my car, but there are definitely areas for improvement. 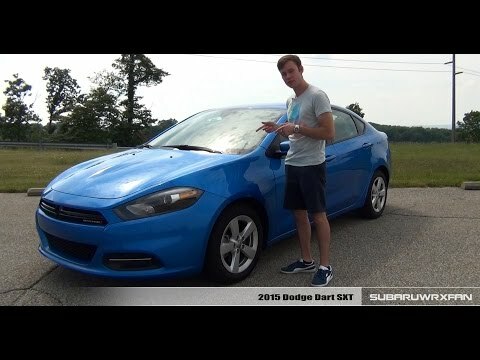 The Dart is a decent car if you just need to get from place to place. The gas mileage is decent(can also use Ethanol fuel) and I like the styling of the exterior. Otherwise it is very lackluster. It looks like it should be a sporty version of an economy car but it's not quick at all and not a particularly smooth ride. There is a decent amount of room inside but the seats aren't very comfortable and everything is very basic. I do like the UConnect entertainment system but even that was a bit dated even in 2015 as there is no nav system or rear camera. No major mechanical issues and I have put tons of miles on it so that says something for sure. There just isn't anything to set it apart from the competitors and resell value is very low. Without a backup layer of software, the control module may fail to prevent an un-commanded torque event, increasing the risk of a crash. Chrysler will notify owners, and dealers will update the Engine Control Module software, free of charge. The recall began on March 25, 2016. Owners may contact Chrysler customer service at 1-800-853-1403. Chrysler's number for this recall is S10. A malfunctioning TPMS light will not notify an owner of an improperly inflated tire. An improperly inflated tire may experience a complete loss of tire pressure, increasing the risk of a vehicle crash. Chrysler will notify owners, and dealers will reconfigure the vehicles from a lowline TPMS to a highline TPMS, free of charge. The recall began on January 27, 2015. Owners may contact Chrysler customer service at 1-800-853-1403. Chrysler's number for this recall is P76.